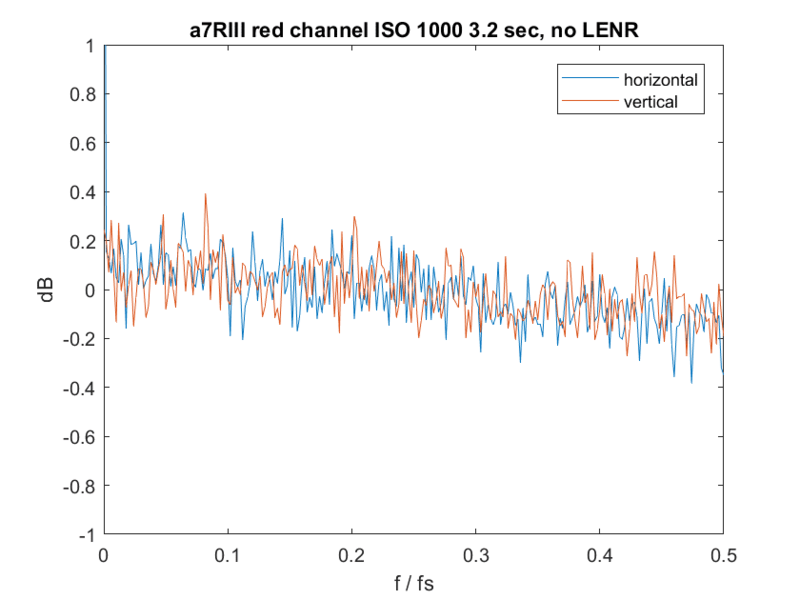 This is the first in a series of tests of the Sony a7RIII (and a7RII, for comparison) spatial processing that is invoked when you use a shutter speed of longer than 3.2 seconds. To see the other posts in the series, scroll to the bottom of this page (below the comments) and you see the titles of the other posts. If you click on them you’ll go to the posts themselves. There has been a long-simmering controversy about some spatial filtering in the Sony a7x cameras that is silently invoked in some exposure modes. There is no way for a user to turn this off. 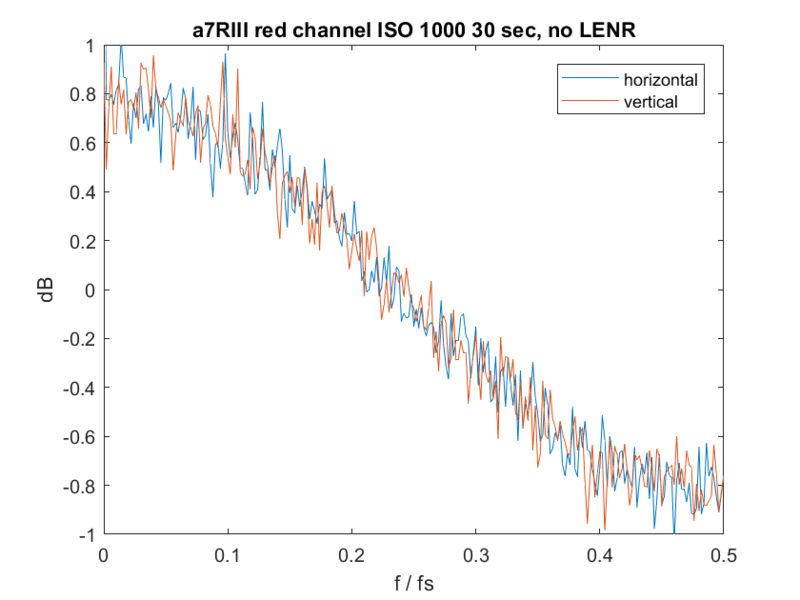 The simmering reached a rolling boil when Sony released Firmware 3.30 for the a7RII, which increased the range of shutter speed settings over which the spatial filtering operated. They did this without announcing that the change was taking place, and provided no path for users who upgraded their cameras, didn’t like what happened to them, and wanted to return to the old firmware. Here is an explanation of what is probably the algorithm that Sony is using; fair warning, that material is fairly technical. I wrote a report on the spatial filtering in FW 4.0. It’s here. It turns out that the spatial filtering, which is called the “star eater” algorithm because of its effect on some kinds of astrophotography, is readily identifiable by looking at Fourier transforms of dark-field exposures. You don’t need to shoot stars to tell whether the camera has an appetite for them. Now that Sony is about to ship a new camera, the a7RIII, there is interest in its taste in stars. Rishi Sanyal, Deputy/Technical Editor for DPR, provided me with some dark-field a7RIII captures. I looked at their spectra. Here’s what I found. 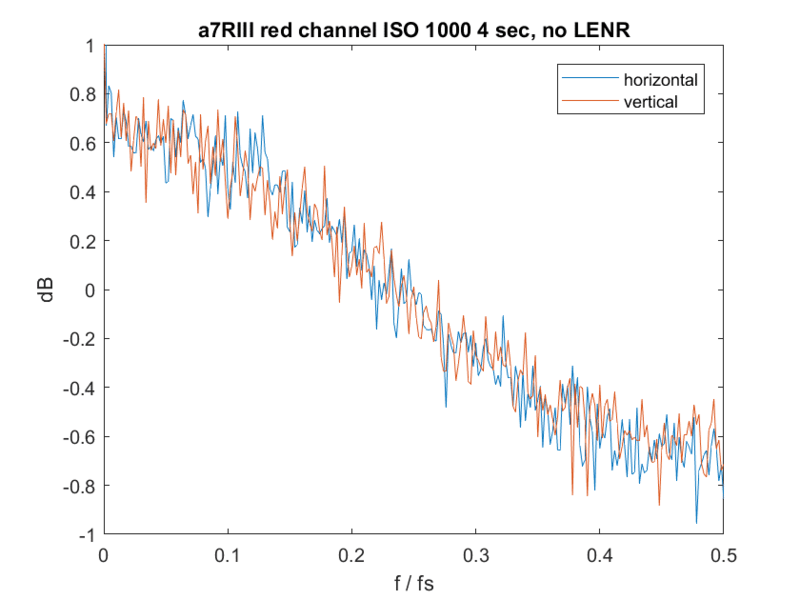 The horizontal axis is spatial frequency, with fs being the a7RII sampling frequency, and thus the Nyquist frequency for the camera is on the far-right side. The vertical axis is the noise at any given frequency in decibels (dB). If there were no spatial filtering at all, the curves would be horizontal. The above curves tend to be lower at high frequency than at lower ones, indicating that the camera is slightly attenuating the higher frequencies. At ISO 1000 and a shutter speed of 1/1000 second, the spatial filtering is very mild. I’ll be exploring the nature of that filtering in a future post, but it is something we saw in FW 4.0 on the a7RII, and is not the much stronger filtering that causes the star eating. At a shutter speed of 3.2 seconds, things look about the same. However, at 4 seconds, the spatial filtering kicks in big-time. Look out, stars! A timed exposure of 30 seconds looks about the same. A one-minute bulb exposure is maybe a little worse. I think this is a missed opportunity for Sony. Thanks again for documenting so clearly Sony’s continued manipulation of their raw files from long exposures. Just one minor point of clarification – although you state above that the filtering was extended from bulb to all manual exposures longer than 3.2 seconds in the v. 4.0 firmware, your post of November 29, 2016 documents its introduction in the v. 3.3 firmware. True enough. I goofed, and I’ll fix it. Thanks. Thanks for your analysis. It’s a shame it still has the spatial filtering but not entirely unexpected. 1) 2 dB of attenuation doesn’t seem like very much. 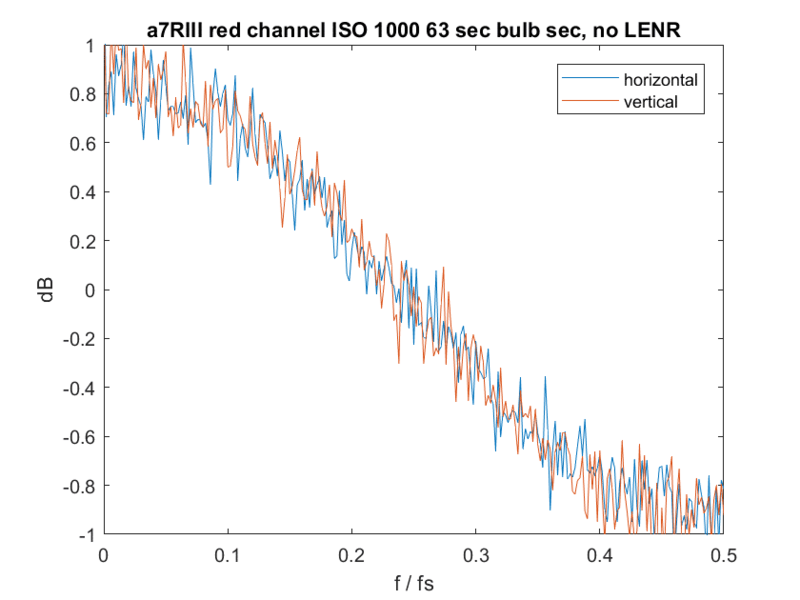 How does this compare to the attenuation of previous A7x cameras? 2) Why do you make the average of the power spectrum 0 dB? Doesn’t this imply that low spatial frequencies are being amplified by ~1 dB? In other words, wouldn’t it make more sense to show that low spatial frequencies have 0 dB of attenuation and the high frequencies have -2 dB? 2 dB of attenuation doesn’t seem like very much. 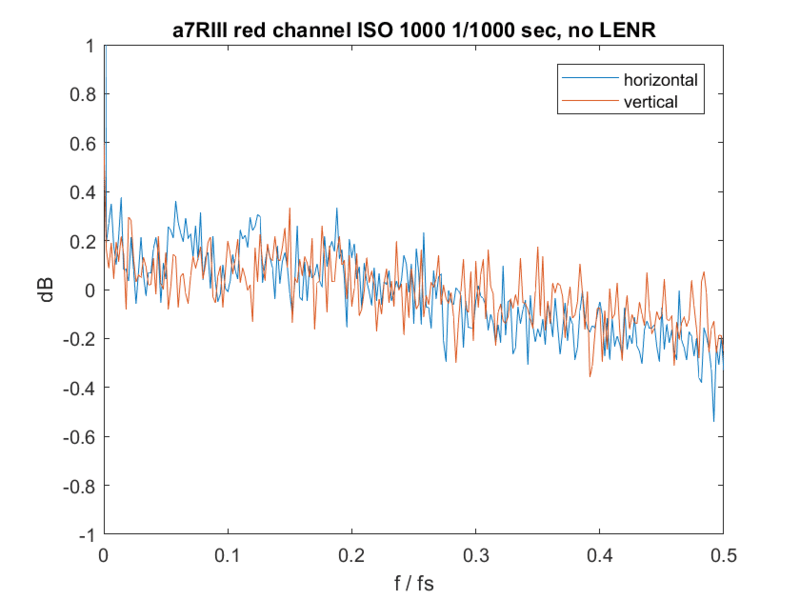 How does this compare to the attenuation of previous A7x cameras? The same, at the places on those cameras where this algorithm kicks in. Why do you make the average of the power spectrum 0 dB? It keeps the part of the curve you want to pay attention to in the middle of the graph. Doesn’t this imply that low spatial frequencies are being amplified by ~1 dB? No. 0 db is arbitrary. In other words, wouldn’t it make more sense to show that low spatial frequencies have 0 dB of attenuation and the high frequencies have -2 dB? Then you’d have to figure out how to deal with the really high values near dc (0 frequency). Those values come from fixed pattern read noise components. In other words, the input to the spatial filtering the camera does doesn’t start out completely flat. Thank you for your research – however, rather than looking at the numbers, I would love to see a physical ‘loss’ in stars via actual imagery and a stack up against other camera manufactures sensors as well. Good idea. Sounds like a lot of work. If and when you decide to do it, let me know and I’ll be interested in what you find out. I can see lots of problems in setting up such an experiment and making it quantifiable and repeatable, but you may have some good ideas. If it were me, I’d start with an artificial star source. Real stars are subject to many incontrollable variables. If there are so many uncontrollable variables then doesn’t it make testing nearly impossible (or at least, impractical?) I had seen some side by side RAWs via the Petapixel post and they looked good. I saw more stars in the longer exposure then I did in the shorter. Do you have visuals you can share that would disprove this? The original post with the RII had a much clearer day and night visual appeal when it came to the stars being deleted after 3.2″. I don’t see that with this new camera. I think you are making my point. You don’t need to take pictures of stars in order to prove the existence of spatial filtering. No, I do understand your point – but what exactly does .08 to -.08 worth of spatial filtering actually look like? Testing a body cap is one thing, but an actual photo that has the elements in it is another. The examples I’ve seen of both the A7RII and the A7RIII seem quite different. Even if spatial filtering is present, the image still looks much better than the previous firmware, especially compared to this. I think you’re off by an order of magnitude. I am confused. You say it still exists and this says it doesn’t. We can’t both be right, can we? Regarding the test reported by PetaPixel, I downloaded the raw files used for that comparison. The stars are large enough and trailed sufficiently that the spatial filtering left them relatively untouched. If he had used sharper optics and a tracking mount there would have been more star damage. By the way, I have received images of star fields that purport to show that the a7RIII fixes the problem. In none of the images that people have sent me are single-pixel stars visible. I haven’t seen the raw files. JimK, did your test use a tracker and sharper optics? Or was it just a stationary camera?